The expression “time is money” doesn’t get any truer than when the cameras start rolling. If your shoot is not carefully scheduled, your budget will start evaporating. Consider an average half-hour television show: they shoot for a hundred hours in a given week on a budget of around $1,700,000. This prescribes a ‘burn rate’, or the amount of money required to keep a professional crew operating, of nearly $20,000 an hour. No two production schedules or budgets are alike, but they all adhere to the same basic principles. Scheduling starts with a good breakdown. The breakdown and catalog allow you to manage your assets and determine the most time and cost effective way to schedule those assets across your shoot days. Learning how to schedule a shoot means learning how to manage assets. Camera crews need to wait on set decoration before they can get the grips to start setting up lights. Hair, makeup, and wardrobe need to wait on transport to get the talent in the chair. Craft service needs to be on set before anyone to ensure that the food and coffee is ready to go. These timings are essential to informing your call times . If you have crew showing up on set when they’re hours away from being able to do any work, you’re just paying them to socialize. Where do your scenes take place? If you’re shooting in a studio, you’ll have to schedule prep days for your carpenters and dressers to build, paint, and decorate the sets. Your grip and electrical departments will need time to set up lighting grids and offload equipment. Your cinematographer will need to do camera tests. 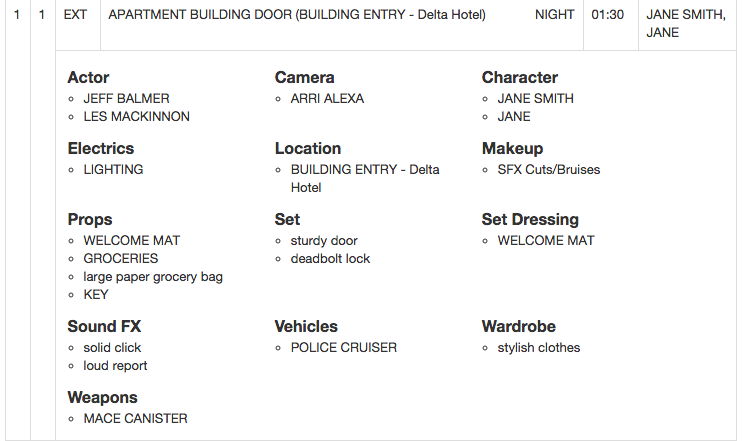 All of these things need to be completed before your shoot day. Similar rules apply for shooting on location. How many days do you have the location for? How long will it take to set up the location for shooting and move from the location when you’re done. Don’t forget to include prep and moving days on your calendar. Celtx integrates all of your logistical and production data into a single location, and makes generating schedules, reports, production calendars, and call sheets simple. Very few productions shoot their scenes in the order they appear on the page. It is important to try and get as much out of a single set or location as possible. For example, If your script has multiple scenes that take place in a diner and you’ve secured two days on location in a diner, schedule all your diner scenes for that period. The same principle applies to night shoots or weather-specific scenes. The director’s job is to carry the narrative. Your job is to make the process as efficient as possible, even if that means shooting the last scene first and the first scene last. Generally speaking, one page of your script equals about one minute of screen time. One minute of screen time is roughly an hour of shooting. However, a scene that is a couple of lines on the page can take far longer to shoot than a scene that is a couple of pages. This is especially true when it comes to action and stunt-heavy scenes or scenes involving children or animals. If your script calls for things like car chases, fights, or any wrangling, remember that the prep and rehearsal time required to execute these types of scenes is exponentially larger than the time required to shoot two adult characters talking. While putting in all your pre-production prep work helps keep cast and crew on the same page and on-time, there’s always the potential for setbacks. Part of pre-production is preparing for the any number of things that can go wrong on set for any number of reasons: equipment failures, foul weather, illness, accidents, and good old fashioned bad luck. A tight schedule is important, but you should always try to give your production a little breathing room. Don’t try to cram as much material as possible into any given day. You’ll exhaust your crew, open yourself up to logistical nightmares, and shrink the window of opportunity needed to address whatever crises may arise.